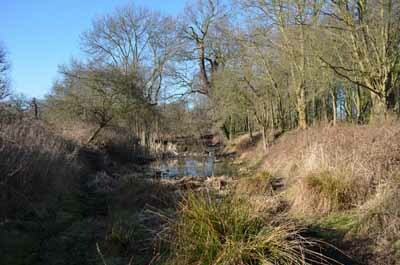 One of the notable historic features of the park, the moat at Cockerells situated very close by the main car park. The top map is modern (1980) and orientated normally, north/south, the second map is a section of the 1633 map Dr. Laurence Wright commisioned. It is the earliest known map of the manor and was issued on his instructions. It is orientated roughly east/west. It shows both the moats at Dagenhams (part remains as the Lily Pond) and the Cockerells Moat showing the centre of the moat as an orchard with buildings close by. The Green Pond can also be made out to the left of the moat. 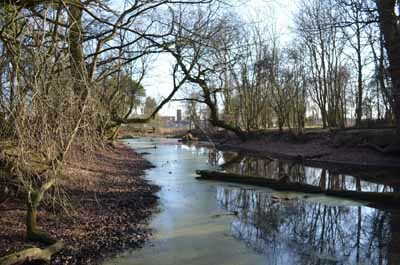 "The monument includes a medieval moated site situated on gently sloping ground south-east of Hatter’s Wood. 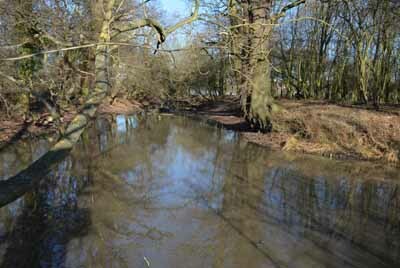 The moated site is sub-rectangular in shape and has slightly rounded corners. It is orientated north-west to south-east and is about 84m long and 78m wide. 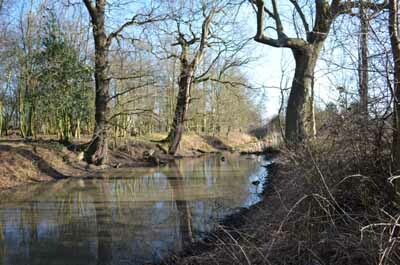 The moat varies between about 6m and 16m wide. At the centre is a square island or platform, which is about 55m by 55m. On the south-east side is a causeway providing access to the interior. The moated site is associated with the manor of Cockerels, or Cockerells, and probably encloses the remains of a manor house. In the 13th century, Cockerels formed an adjoining tenement to Dagenham and was held by John of Weald. In 1433, it was held by Henry Percy, Duke of Northumberland, and subsequently passed to his descendants. 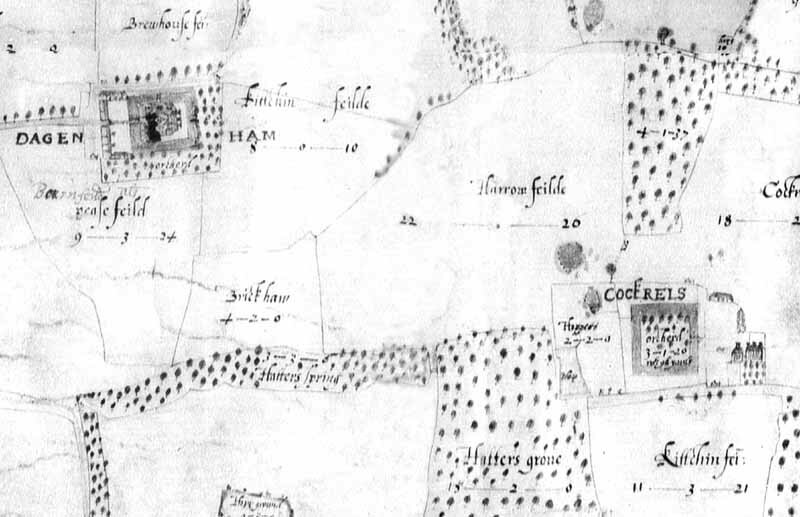 In 1633, Cockerels House, a substantial gabled building, stood just to the south-east of the moat, which was by that time in use as an orchard. In the 19th century the house became Dagnampark Farm, which was demolished in 1948. 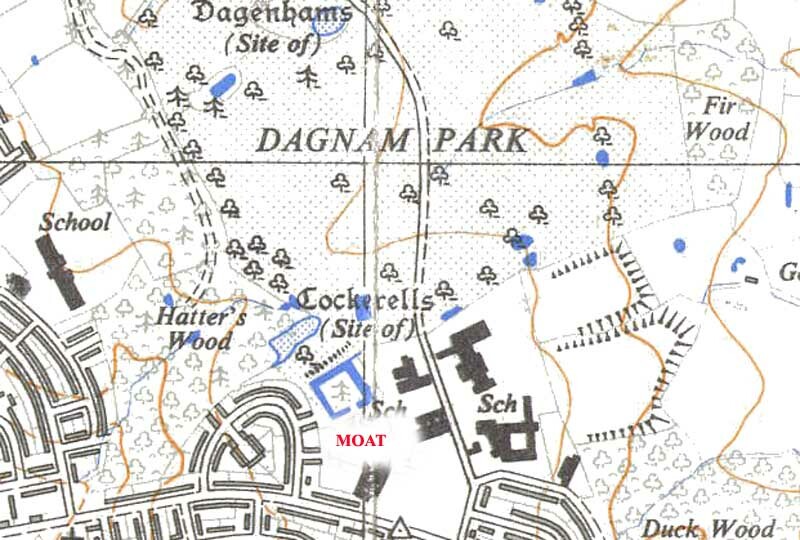 The moat appears on OS maps (1:2500) of 1871, 1896 and 1920." 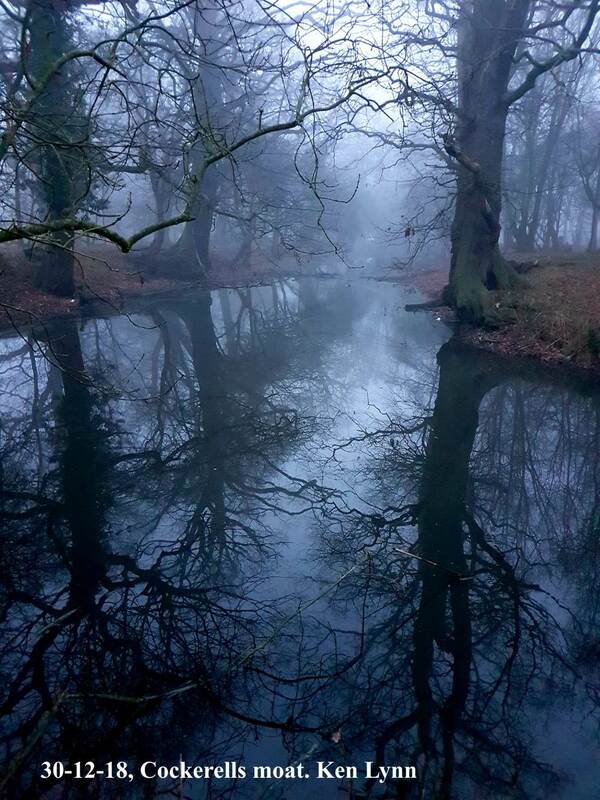 The Moat is a "Scheduled Ancient Monument" defined by wikipedia as an "archaeological site or historic building, given protection against unauthorised change. The various pieces of legislation used for legally protecting heritage assets from damage and destruction are grouped under the term ‘designation’. The protection given to scheduled monuments is given under the Ancient Monuments and Archaeological Areas Act 1979, which is a different law from that used for listed buildings (which fall within the town and country planning system). A heritage asset is a part of the historic environment that is valued because of its historic, archaeological, architectural or artistic interest. Only some of these are judged to be important enough to have extra legal protection through designation. There are about 20,000 scheduled monuments in England representing about 37,000 heritage assets. Of the tens of thousands of scheduled monuments in the UK, most are inconspicuous archaeological sites, but some are large ruins. According to the 1979 Act, a monument cannot be a structure which is occupied as a dwelling, used as a place of worship or protected under the Protection of Wrecks Act 1973. As a rule of thumb, a protected historic asset that is occupied would be designated as a listed building." Thanks to Don Tait for taking the four photos below in February 2012. 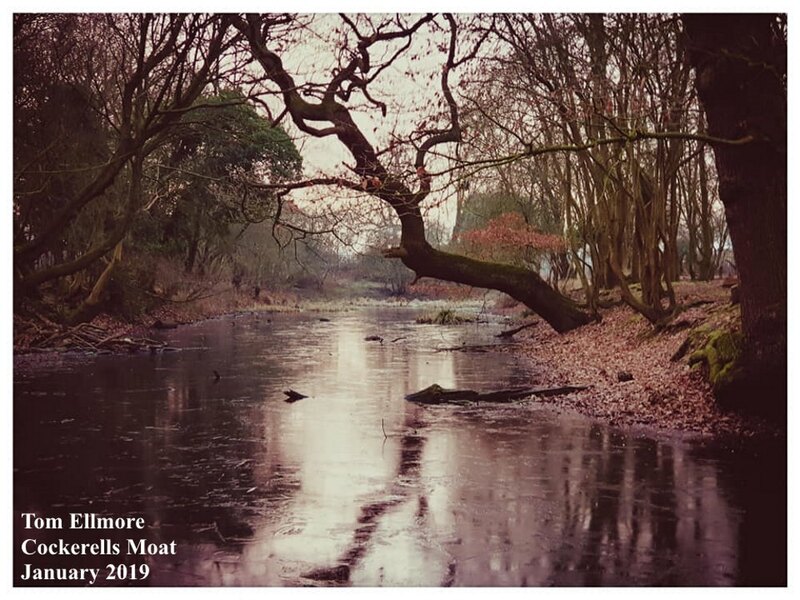 They were taken after an extended dry period which has left the water at an unusually low level with the moat only partially filled, unusual for this time of the year.